It contains pro-B5, natural and organic extracts and oils. It is enriched with organic olive oil and organic aloe vera, moisturizing deeply and leaving the skin refreshed and velvety soft. 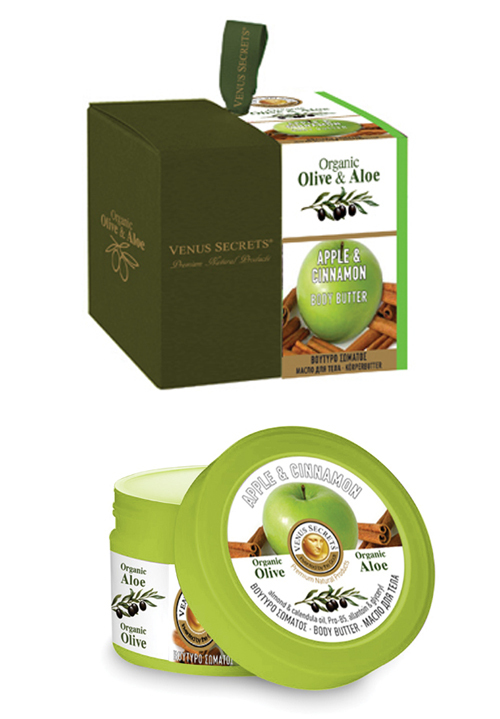 USAGE: Apply the body butter to your entire body, concentrating especially on dry areas. Body butter's No. 1 use is moisturizing. It will restore moisture to your skin and help replenish the healthy look. Body butter has been known to help reduce early signs of wrinkling and to help make skin stronger and more resistant to being stretched. Use body butter after you get out of the shower or the pool. Body butter is also good when coming in from the cold. Water soaking into the skin will dry it out and crack it, but body butter will help keep the skin moisturized and lock the water and bad moisture out of your skin. This gives your skin a clean and shiny look all day. Aqua, cetearyl alcohol, glyceryl stearate**, peg-100 stearate, butyrospermum parkii**, glycerin**, isopropyl myristate, theobroma cacao**, sodium cetearyl sulfate, caprylyl glycol**, lanolin alcohol **, olea europaea *, prunus amygdalus dulcis oil**, glycine soja**, calendula officinalis**, aloe vera barbadensis*, ethylhexylglycerin, butylene glycol, allantoin**, parfum, eugenol, cinnamal, cinnamic alcohol, linalool, amyl cinnamyl alcohol, panthenol***, xanthan gum,punica granatum extract**, tocopherol***, camellia sinensis extract**, lavandula *angustifolia extract, hydrolyzed milk protein**, lyceum barbarum extract*, carica papaya extract**, alcohol, phenoxyethanol, C.I. : +/- (16255, 42090, 47005, 45100, 19140). *organic **natural/vegetable origin ***vitamins No parabens, No silicones, No propylene glycol, No mineral oils, Not tested on animals. Clinically and dermatologically tested.